Hosts Chile reached their first Copa America final in 28 years after seeing off the 10 men of Peru in a thrilling encounter in Santiago. Chile could have had midfielder Arturo Vidal sent off early on before Peru defender Carlos Zambrano was dismissed. Former QPR striker Eduardo Vargas then put Chile ahead after Alexis Sanchez had hit the post but Peru levelled through a Gary Medel own goal. But Chile deservedly won it when Vargas fired home a fine second from 25 yards. Chile have never won the Copa in 99 years of trying but will now play either Argentina or Paraguay in Saturday's final. Juventus midfielder Vidal was lucky to escape punishment for thrusting his hand into the face of marker Zambrano before Peru hit the post through Jefferson Farfan's header. Zambrano was not shown the same leniency from referee Jose Argote in the 20th minute when he was shown a straight red card after catching Charles Aranguiz on his follow-through as he cleared the ball downfield. Peru were furious and were further aggrieved before half-time when Sanchez's cross struck the post and Vargas scrambled in, with replays suggesting the striker was marginally offside. The two contentious decisions were the latest chapters in a tournament marred by controversy on and off the pitch. after an incident in which he appeared to poke his finger against Uruguay striker Edinson Cavani's backside. After the break Vargas was this time unlucky to see a strike incorrectly ruled out offside before Peru counter-attacked to perfection to level. Former Cardiff midfielder Medel stretched to cut out an excellent cross from right-back Luis Advincula but could only turn past his own goalkeeper Claudio Bravo. Peru had deserved their equaliser but were behind again four minutes later when the busy Vargas lashed in a stunning second, dipping a shot beyond Pedro Gallese from 25 yards. Peru, who also lost in the 2011 semi-final, tired after that goal and Arsenal forward Sanchez clipped the top of the bar from an angle as Chile saw out the win. What a thoroughly enjoyable match. Well worth staying up for! 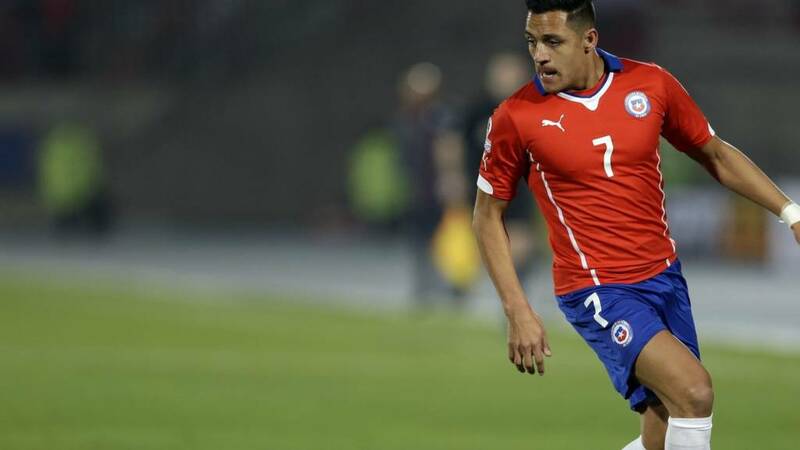 Chile have yet to win a major international tournament but is that about to change? Thanks for your company. Who will Chile meet in the final at the weekend? The second semi-final between Argentina and Paraguay is on Wednesday (00:30 BST). Full live text commentary on the BBC Sport website. They played their part in a breathtaking match full of incident, magical moments and controversy. While Chile can start planning for the final, Peru can take plenty of positives as they prepare for World Cup qualifying which begins in October. Terrific celebrations inside Estadio Nacional. Chile are in the Copa America final for the first time since 1987 - 90 minutes away from a first major tournament win. One minute left. It's now or never for Peru. Chance for Arturo Vidal to seal it but his fiercely struck effort crashes off the frame of Peru's keeper. This has been a cracking advert for Copa America. A game peppered with sublime moments, controversy and terrific committed football by both teams. Three minutes of stoppage time. Chile are 180 seconds from the final. Three minutes remaining. Whistles from the home fans have started already. They want the referee to blow his whistle. Paolo Guerrero runs into the Chile penalty area before ending up in a heap after tangling with Jose Rojas. The Peru forward wants a penalty. The referee says no. Guerrero reacts by thumping the grass in frustration. Peru are still showing signs of fight, still showing how to play with 10 men. Whatever happens, this has been a fine effort by the team ranked 61st in the world. So close to 3-1 as Alexis Sanchez fires over from an angle inside the area. Peru's defence is under serious pressure. The party has already started in Santiago. Chile are so close to their first Copa America final for 28 years. Last throw of the dice by Peru boss Ricardo Gareca. Forward Andree Carrillo departs and striker Claudio Pizarro is on, while midfielder Carlos Lobaton is off for Yoshimar Totun. Chile are not sitting back. They want a third goal to kill the tie off once and for all. There's time left for battling Peru to get themselves back into this but there are a lot of tired legs out there. Peru have just over 20 minutes to get back into this. Remember, there is no extra time if the scores are level after 90 minutes. Should Peru level, it will go straight to penalties. Right now, you wouldn't rule it out. Chile are back in front thanks to an absolutely stunning 30-yard dipping strike by Eduardo Vargas. There's a party inside Estadio Nacional. Brilliant game. Ten man Peru are level - and deservedly so. Another counter attack by the visitors sees Luis Advincula whip in a fine cross into the danger area and Gary Medel, trying to clear, diverts the ball into his own net. Will Peru get a better chance? A massive chance for Jefferson Farfan to pull 10-man Peru level as Luis Advincula delivers a delicious cross for his team-mate. But the chance goes begging as the ball strikes Farfan's shoulder and straight to the keeper. Had that come off his head it would surely have been in the net. It's a cold dank night in Santiago. But Chile substitute David Pizarro should be used to these conditions after spending a short stint on loan at Manchester City in 2012. Perhaps Peru need their goalscoring centre-back to dig them out of this hole. Going into this match defender Carlos Ascues had scored five goals in 10 matches. The Chile fans in the Estadio Nacional seem very calm with their team looking good for a place in the Copa America final for the first time since 1987, when a 20-year-old Ivan Zamorano was in the squad. And he's here tonight commentating for Chilean TV. Eduardo Vargas has the ball in the back of the Peru net. But what's this? Up goes an offside flag. Televsion replays show it shoud have been given. Not a good night for the officials in Santiago. Not just one change for Chile but two. Midfielder Marcelo Diaz and defender Miiko Albornoz have been replaced by David Pizarro and Eugenio Mena respectively. The locals give Chile a terrific reception as both teams emerge for the start of the second half. A huge 45 minutes coming up in Santiago. Don't forget the second semi-final between Argentina and Paraguay takes place on Wednesday (00:30 BST). Can Barcelona forward Lionel Messi round off a superb season for club and country with yet another winners' medal? There will be a full live text commentary of that game on the BBC Sport website. There's been a lot made of the Pisco argument, with Peru and Chile both claiming they invented the Pisco sour cocktail. But ignoring the disagreements over alcohol drinks - they also both claim to have invented the bicycle kick. Apparently the Peruvians call it the chalaca, while in Chile it's called chilena. Given the history between the two teams it's no surprise that there's going to be more red cards than bicycle-kicks tonight. You get the feeling this tie is far from over. Peru might be a man down but they are far from out of this, especially with the dangerous Jefferson Farfan and Paolo Guerrero prepared to run at the Chile defence. But the hosts will be kicking themselves if they don't book their place in the final now against 10-man opponents. Controversy galore in that first half. And Peru's players are arguing with the referee as they leave the pitch at the end of the first half. Chile don't care. Their players form a huddle on the pitch before retreating to the dressing room. And it's come from a player who was on loan at QPR last season! Alexis Sanchez's cross-shot clatters the Peru post and rolls out for Eduardo Vargas to stab home. Chile are within sight of their first Copa America final since 1987. It might be goalless but this is a belting game. Both teams are throwing everything at it. End to end and now it's Peru breaking forward through Paolo Guerrero who passes to Jefferson Farfan eight yards out but Chile keeper Claudio Bravo is alert to the danger. Surely this is the breakthrough as the ball rolls to the unmarked Eduardo Vargas eight yards out. All the Chile forward has to do is tap it in but Luis Advincula somehow gets in the way to save his side from falling behind. How on earth did he manage that. Advincula celebrates his goal-saving heroics with a fist pump. And so he should. That was mightly impressive. You can't take you eyes off this. Peru have been forced into a reshuffle after being reduced to 10 men. On comes defender Christian Ramos with midfielder Christian Cueva sacrificed. Here they come again. Another rampaging move sees Jorge Valdivia curl a chance just wide following good work by Alexis Sanchez. The refereeing in this tournament has been poor to say the least. Peru were on top up until Zambrano's red card. Another free-kick to Chile. Another huge roar from the home fans. Peru are down to 10 men as defender Carlos Zambrano is shown a straight red card for a foul on Charles Aranguiz. He clears the ball away and catches Aranguiz on his follow-through. It's harsh and no way as malicious as Arturo Vidal's hand in Zambrano's face earlier. A huge call by the referee. Peru are furious. Chile's fans are celebrating as though their team has scored. Peru must play the rest of the game a man down. The Chilean newspaper La Tercera ran an article today suggesting that: "everyone is waiting for Alexis Sánchez to wake up". Seems a bit harsh on Alexis, who's looked dangerous for Chile so far in the tournament. Meanwhile to continue the newspaper review, La Cuarta were reporting on Gonzalo Jara's three-match ban (reduced to two on appeal) The newspaper's reaction: "They cut off his hands!". Not to miss a trick a guy was selling Jara hats outside the stadium with a single finger sticking out from the top. Was Gonzalo Jara harshly treated?Image caption: Was Gonzalo Jara harshly treated? They're far from intimidated inside the host nation's national stadium and are handling themselves very well. Another fast-flowing move by the visitors sees Paolo Guerrero tee-up Carlos Lobaton who lets fly with the outside of his boot, the ball fizzing just wide of the target. Fifa is not real life though is it Leslie? No. It isn't. First booking of the game - but probably not the last on the evidence of the 15 minutes - goes to Peru's No 5 Carlos Zambrano after a foul on Alexis Sanchez. A foul? Yes. A booking? Not really. Inconsistent from the Venezuela referee who earlier failed to punish Chile's Arturo Vidal for a hand in the face of Zambrano. Chile might be the top scorers at Copa America 2015 with 11 goals - more than double Peru's tally of five. But the only hat-trick of the tournament so far was scored by a Peru player. High tempo stuff and Peru are clearly not here to make up the numbers. They're rising to the challenge in a hostile atmosphere and go so, so close to breaking the deadlock as Jefferson Farfan heads against a post following Paolo Guerrero's cross. Venezuela referee Jose Argote is the busiest man on the pitch - and this is already turning into another bad tempered Copa America clash. Chile's Juventus midfielder Arturo Vidal is a very lucky man as he puts his hand in Carlos Zambrano's face as the Peru defender shields the ball out for a goal kick. Red card? Astonishingly, Vidal escapes without a caution. It's like a 100m final. Action at both ends but the first serious chance falls to Chile's Eduardo Vargas whose fierce strike from a long ball forward is deflected behind. If the national anthems were an indication of what is to come, we're in for a cracker. Both teams belted out their respective tunes with real gusto. Team huddles out of the way...the first semi-final of the 2015 Copa America is under way. Chile XI: Bravo, Isla, Medel, Albornoz, Rojas, Diaz, Aranguiz, Vidal, Valdivia, Sanchez, Vargas. Peru XI: Gallese, Zambrano, Vargas, Cueva, Advincula, Lobaton, Farfan, Carrillo, Ballon, Ascues, Guerrero. Can Chile handle the pressure of a nation's expectations? What a noise inside Santiago's Estadio Nacional as both teams emerge from the the tunnel. There isn't a spare seat in the house. Alexis Sanchez has come a long way since starting his career in the Chilean mining city of Cobreloa. Can the 26-year-old Arsenal forward add a Copa America winners' medal to the FA Cup medal he picked up at Wembley last month? Fifth time luck for Los Incas? Peru have reached the semi-final of Copa America four times since they last won it in 1975. Will fans of Los Incas finally have something to smile about later? Eight-time winners Brazil are conducting an inquest into where it all went wrong after the defending champions were beaten 4-3 on penalties by Paraguay in the quarter-final. Colombia, ranked fourth in the world, and Uruguay, a further four places behind, failed to make it past the quarter-final stage after losing to Argentina and Chile respectively. Argentina, who face Paraguay in the other semi-final (00:30 BST) on Wednesday, will be fancied by many but the likes of Lionel Messi and Sergio Aguero have yet to fire, with the team ranked third in the world scoring just four goals in four games in Chile. Argentina, Chile, Paraguay and Peru remain but who is going to win Copa America 2015? And why? There's huge interest in Argentina in this semi-final. And not just because they could be facing Chile or Peru in the final. Chile boss Jorge Sampaoli and Peru manager Ricardo Gareca are both from Argentina. Chile fans have warmed to Sampaoli, 55, since his appointment in 2012. He has frequently been sent off for excessive complaints. Famously, on one occasion early in his career, in a low-level game in his native Argentina, he reacted to his expulsion by pacing out of the stadium, climbing a tree and watching the rest of the match from his perch! Peru make up the biggest ex-pat community in Chile, so plenty of interest in Santiago throughout the day. Car horns were blaring early in the morning and by 10am Peru fans were gathered outside the hotel where the team is staying. It attracted an unnecessarily large police turn out. Meanwhile the Chile fans I've spoken to are concerned about Gonzalo Jara's replacement in defence Jose Rojas. Apparently his club form has been woeful recently. When it comes to international football rivalry, Chile against Peru is right up there with the best of them. The rivalry has been fed by historical feuds and lingering bitterness. Remarkably both also believe they were the first to invent the overhead "bicycle kick". Chileans believe the technique was first used in a match in 1914 while Peruvians claim the move was first attempted in the Peruvian port of Callao in the 18th century! Chile make two changes from the side that started the 1-0 win over Uruguay in the quarter-final. Former West Brom and Nottingham Forest defender Gonzalo Jara is suspended after being sent off in that game. His place goes to Hannover's Miiko Albornoz. There's another change in defence as Jose Rojas starts in place of Eugenio Mena. Arsenal's Alexis Sanchez also starts for the hosts. Peru make three changes from the team that started the 3-1 quarter-final win over Bolivia. In come midfielders Carlos Lobaton and Josepmir Ballon, as well as forward Andre Carrillo. Brazil are long gone, Uruguay have been sent packing too and Argentina are struggling to sparkle. Surely Chile will not get a better chance of winning a first major tournament? Standing in their way of a first Copa America final appearance for 40 years is Peru. Trust me, they would love to cause an upset inside Santiago's Estadio Nacional. There's no love lost between Chile and Peru. None whatsoever. Is 2015 the year for red hot Chile? They have never won the Copa America, let alone the World Cup. Despite 19 previous semi-final appearances in South America's top international tournament, all Chile have to show for their troubles is four silver medals. But roared on by an expectant nation and aided by the lightning quick skills of Arsenal forward Alexis Sanchez, La Roja are close to making history. Beat bitter rivals Peru in the semi-final and the 2015 hosts are within touching distance of striking gold for the first time.